Strattons Hotel in Swaffham has an established reputation as an award winning quality boutique hotel with a strong environmental policy. The project involved the demolition of existing garages and conversion of existing buildings into hotel suites and café with a new build link. 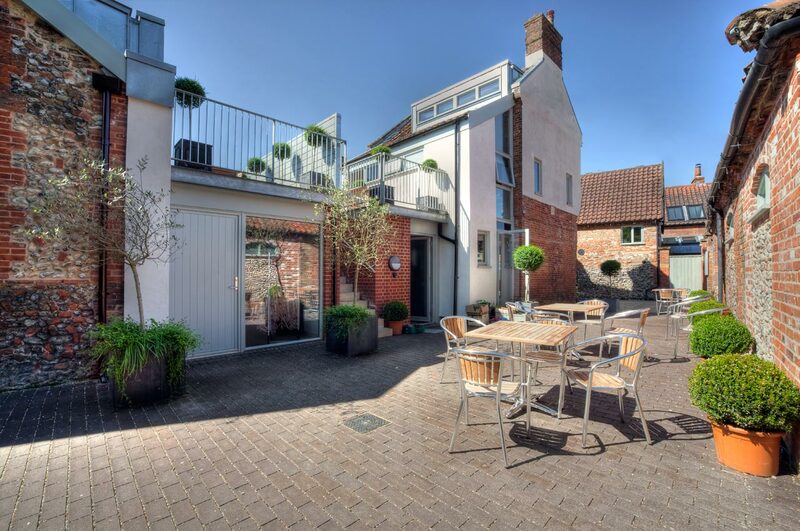 The site consisted of two properties of traditional brick and pantile roof construction. One was formally used as a print works and was in very poor condition. The other was used as a dwelling for staff at the hotel. Whilst the existing buildings were not listed they are within the conservation area. All materials for the building fabric were selected with due regard to their environmental impact and their function within the building envelope. Timber has been used extensively and cellulose fibre insulation which is made from recycled newspapers. Other materials used include organic paints and stains and natural floor finishes. The new build link includes a roof terrace which maintains the low scale of the single storey link whist providing useful space and visual interest. Careful screening avoids any issues of overlooking to neighbouring properties. The new elements add to the quality of the existing buildings by using both modern and traditional materials in a functional aesthetic that does not try to imitate past architectural styles. The conversion has involved a substantial amount of careful repair and detailing. This was essential in order to balance the requirements for high quality contemporary hotel accommodation with the grain and fabric of Swaffhams conservation area. The scheme overall adds to the success of a well established award wining business within Swaffham and further helps to make the town more attractive for visitors and staying guests.